Gum Trees ( MYRTACEAE ). The caterpillar joins the leaves together with silk to make a shelter in which it lives. If threatened, the caterillar curls into a 'C' shape. The caterpillar pupates in its shelter. 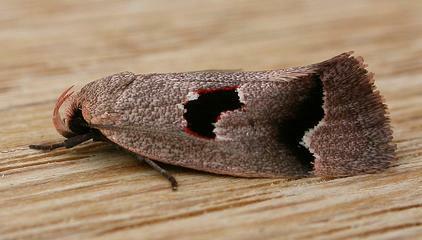 The adult moth has brown forewings, each with two white-edged black marks. 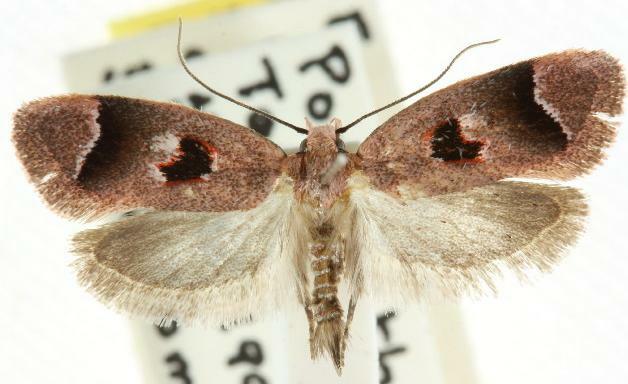 The hindwings are brown fading to white at the bases. The wingspan is about 2 cms. Melbourne University Press, 1990, pl. 4.12, p. 223. CSIRO Publishing, Melbourne 1994, pp. 142, 253, 255, 256. Volume 10, Part 4 (1886), pp. 829-830.